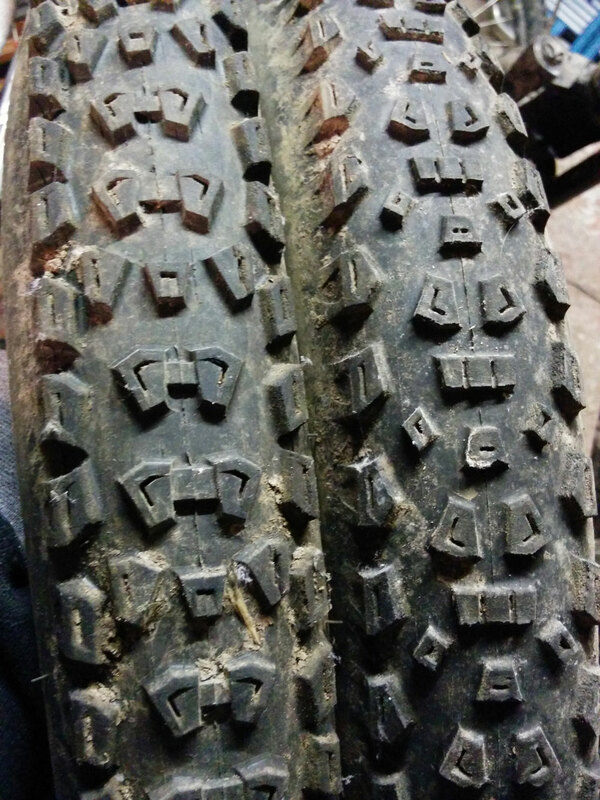 Although I’ve written about each tyre separately here, they’re probably best summed up as a pair – hence lumping them together for the sake of this review. I’ve ridden them both as a pair in 26 and 29er forms and both definitely have their merits. Usually hovering between £15 and £20 on the On One website, these beefy tyres are a match for a lot of rubber that costs twice as much. The space invader-shaped polygonal blocks don’t look like many other tread patterns out there, but the ride feels a bit similar to a Maxxis Minion or Specialized Butcher, with lots of consistent and predictable cornering grip – although the blocks are more shallow and in moist conditions the Monkey will give way sooner. They are made with an “Eckso” casing, which is On One’s typically smartarse way of letting us know that they’ve “borrowed” Maxxis’ sturdy “Exo” casing – which works well with tubeless systems on normal or UST rims and rarely punctures. 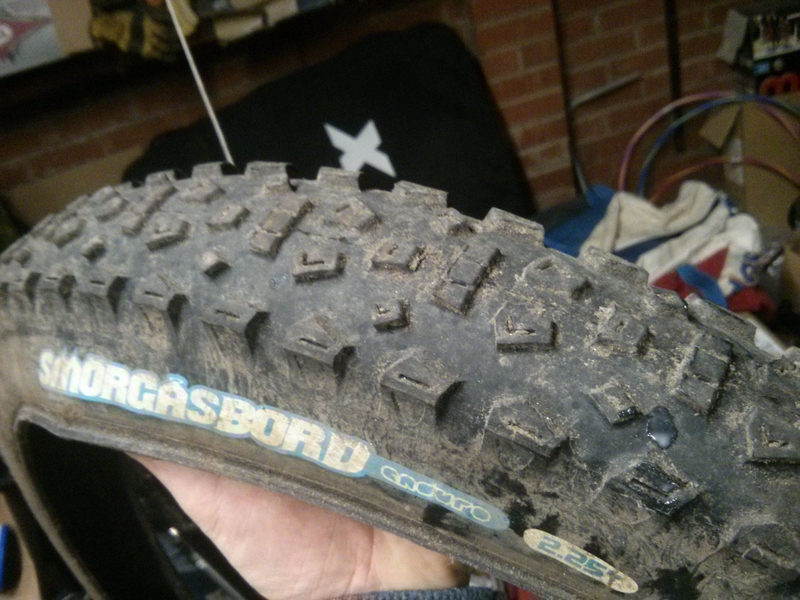 I’ve tried one on the rear but found it a bit too draggy – however it’s one of my favourite front tyres in both 26 and 29in formats for all year round – though the 29er version is a bit draggy if you’re covering a lot of miles. It works OK in most conditions, and is particularly at home on rocky trails. The 2.4in width is about the same as a 2.35in Schwalbe. This photo was taken after a few months use. A bit narrower than the Chunky Monkey, On One’s other own-brand tyre offering also has a more rounded profile and rolls noticeably quicker. In contrast to the Monkey, I’ve only used this tyre on the rear, where it’s been a reliable performer in both 26in and 29in variants. It lacks a bit of off camber grip in 26in form, which was noted when changed for a Minion DHR2 and Hans Dampf. However bigger wheels seem to bring more off-camber grip anyway, so this wasn’t such a factor with the 29in version. The 60a “Enduro” compound version was tested in both instances here and offered a good balance of grip and rolling resistance for a rear tyre. In summary then, the Monkey in particular is a cracking tyre – but both hit the right spot for rugged UK riding in terms of weight, performance and all-round ability. I have put holes in the Smorgasbord, but only when really letting go on rocky trails – which is always a bit of a gamble with single ply tyres.